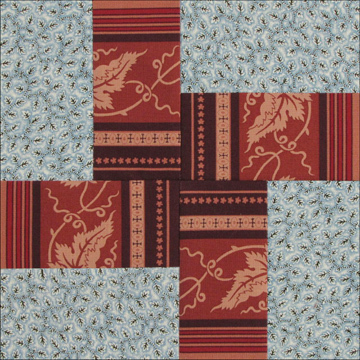 Becky added complexity to a simple block with striped fabric . Illinois Roads recalls Senator Stephen A. Douglas. During the first week of June, 1861, flags flew at half mast. In the midst of preparations for War the Union mourned Stephen A. Douglas, Democratic Senator from Illinois, who had died suddenly of typhoid fever in Chicago. 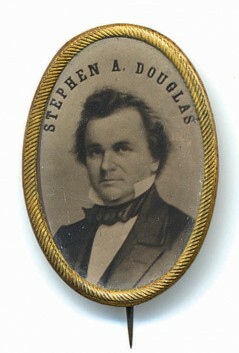 Douglas, the Lincolns and the Union shared a tangled history that began in Illinois, where Douglas sought his fortune in 1833. A native Vermonter, Douglas used intelligence and personal magnetism to ascend to the Senate. He ran for President twice. He represented the free state of Illinois but was a slaveholder. His first wife Martha inherited a Mississippi plantation worked by more than 100 African Americans in slavery. In the same way he made a personal compromise between keeping slaves and representing those opposed to slavery, Douglas in the mid 1850s advocated a compromise between North and South that would permit slavery to extend to new territories. His policy of "Popular Sovereignty" declared that if men who settled the new territory voted to be admitted as a slave state, slavery would be extended west, thus removing the decision and any political backlash from Washington. 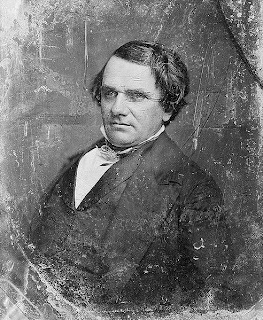 Douglas hoped his bold gesture would propel him into the White House in the election of 1856. 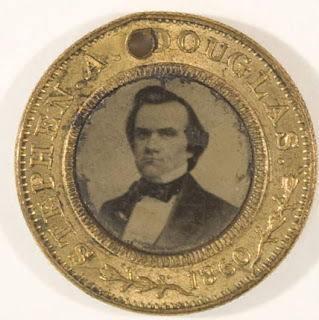 Hindsight permits us to see that Douglas' bill to organize the Kansas/Nebraska Territory with a popular vote on slaveholding was disastrous for both his country and his own political life. Within the year, he was so vilified throughout the Northern states that he joked he could ride from Boston to Chicago on a path brightly lit by the fires of his own burning effigies. 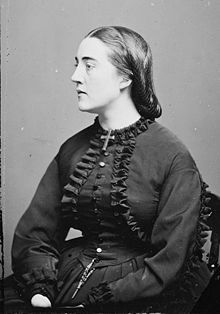 In his youth he'd courted Mary Todd who married political rival Abraham Lincoln. 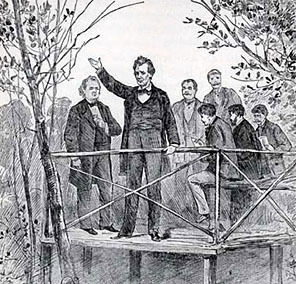 During the 1850s Lincoln and Douglas traveled the roads of Illinois to debate the slavery question, their eloquence on both sides of the issue attracting national attention. They also ran against each other in the Presidential election of 1860, with Douglas representing one branch of the shattered Democrats and Lincoln the new Republicans. 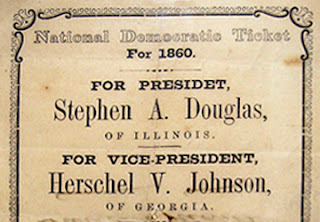 In the spring of 1861 as the Union splintered, Douglas made public gestures to signify support for his rival, holding the new President's hat at the Inauguration, escorting the First Lady to the Inaugural Ball and defending Lincoln's policies in the Senate and back in Illinois. "When the occasion demanded he sprang to the support of the President whose election was gained by his own defeat....Of all these glorious possibilities we can now only say he might have been." Like so much else in the years before the Civil War, we continue to mourn what "might have been." A Cut 4 medium and 4 dark rectangles 2-1/2" x 4-1/2"
Illinois Roads is BlockBase #1615, given that name by the Illinois quilt columnist Nancy Cabot in the Chicago Tribune, 1933. One of the best things about history is gossip, so here's a quote from a letter Varina Davis wrote to her parents on the occasion of Adele's marriage to the older, disreputable Douglas. "Ada Cutts who continues 'bigger than all the men at the springs' [Adele was apparently too tall for Varina's taste] is to be married immediately to Judge Douglas---and any amount of first love and sentiment is talked upon the occasion, and the dirty speculator and party trickster, broken in health by drink, with his first wife's money, buys an elegant, well-bred woman because she is poor and her Father is proud. However, water is going to be introduced into the city, and I trust with a view of making a little more out of the public, and sparing his wife's olfactories Douglas may wash a little oftener. If he don't his acquantance will build larger rooms with more perfect ventilation. However, this wedding has put me out of patience." No wonder Mary Chesnut loved visiting Varina. What a sharp tongue! The letter is on pages 80-81 of Jefferson Davis: Private Letters, 1823-1889 edited by Hudson Strode, 1995. Just in time! Sat down at the computer after finishing my last two blocks... I don't like to be any more behind than that! History is so interesting. I enjoyed reading this. I love the simple block. So many possibilities! Thank you. 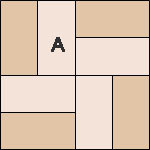 An easy block and some good information. I have completed this block and posted it along with a how-to on my blog. Life has recently pushed me so far behind, I have one cut out and sitting on the table for a week, and it's from at least a month ago. 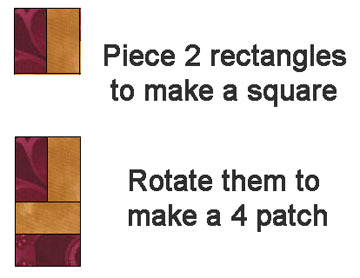 I'm grateful to look forward to this quick and easy block in memory of Douglas and Illinois. Thank you! BTW, thanks for making Facts and Fabrications available for Kindle! I was able to get it immediately and start looking through it. I really appreciate that!